It is sometimes quite difficult for you to decide and choose the perfect color for your kitchen. Besides that, the painting task that you want to make on a kitchen room is very time consuming with all the small areas, little nooks and crannies. You must make sure to select the right type of color and the decision should not be made immediately. You have to take your time without being impulsive during the decision making process. 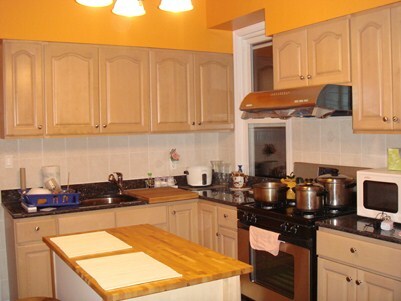 You need at least a few weeks of thinking time before you decide on the right paint color for the kitchen area. Although colors come with many attributes, but the general concept of a color is either stimulating or relaxing and both of this element should be incorporated into your kitchen. Your kitchen color must be too relaxing or even over stimulating where it may cause your appetite to increase whenever you are in the kitchen. One of the ways for you to choose the right combination of colors is by using a color wheel for determining complementary colors for the color that you decide to use. For example, when you are combining basic or primary colors like blue, red and yellow you have to create secondary colors such as green, orange and purple. The mixture of primary and secondary colors would be able to create tertiary colors like blue-green and red-orange. When you are using the color wheel, the opposite colors on the wheel will help you create color pairings for certain colors automatically for you. When you want to choose your wall color for the kitchen, the selected color should complements the color of cabinetry, a predominant backsplash and appliances that you are using in your kitchen. Make sure you highlight the cabinetry. If you have white colored cabinets, you should use a deeper color. For those of you who have wood cabinetry, you need to use lighter color. Other option that you can use is by creating color cohesiveness with decorative art and accessories. The décor that you want to choose for your kitchen must also be suitable with the colors and also the cabinetry. For instance, if you have oak cabinetry you can combine it with a Wedgwood blue works as well as a relaxed barn table. This is to create a country feeling to your kitchen setting. If you are using a red-based paint color, it is much more appropriate for urban-modern furnishings. If you are planning to re-sell the house, it is advisable for you not to use trend-setting colors which can your house look dated. You can try to use nature-inspired colors like terra cotta and granite for adding a color punch but at the same time maintains a classic elegant look which does not look so strong or personal that can easily turn off any potential buyers. Another option is to use softer tones in lighter colors that can help you create a roomy feeling and also making a grand color statement using accessories and art. Another good reason for choosing a lighter color is that it can give you the option of saving excess paint for doing quick touch-ups or even for applying a fresh coat of paint before you want to show the house to any potential buyers in future. Colors that you choose for your kitchen can influence your disposition, appetite and energy level. You need to strategically choose the color for your kitchen to follow your personality and goals for the time that you want to spend within the kitchen area. If you are using orange hues, the color can easily stimulate your appetite which can help those who are pickier eaters during dinner or lunch time. For those who are always drawn to the kitchen, you need to consider painting the kitchen with blue color which not only encourages relaxation but also able to decrease appetite. The red color can stimulate energy while the yellow color can help lift-up your mood. Both of this color is an ideal choice for you to use especially during breakfast. Normally most house owners decorate their kitchen with high-priced cabinetry and countertops which always tend to stand in the ways whenever they want to remodel their kitchen. For those of you who want to draw attention away from your cabinetry you need to select a wall color that matches the color of your cabinetry or at least having the same shade or color family of the cabinetry. The much lesser contrast will be much better if you want to minimize an element’s visual impact. Besides that, the unified line of the matching cabinetry and the color of the wall can help your kitchen look larger than its usual size. You can also consider highlighting your bay window by painting its moulding with contrasting color which is a shade lighter or darker than the surrounding walls. Using stainless steel appliances will result to a modern look kitchen and it also enables you to use variety of color choices that can blend in easily with the appliances. However, try not to use exceptionally dark paint color if you have black appliances. If your appliances are white, you need to use white color paint for your wall surrounding. You can also make use of fabric swatches or paper with different colors resembling of the rainbows such as red, orange, yellow, green, blue, indigo and violet. You can tape the colors in a row on the same wall of your kitchen. If the color suits your kitchen you can tape the rainbow colors on all walls of your kitchen where each area of the room will provide you with different feel. Try to use bold colors that can make a statement within your kitchen. However, you have to choose the color wisely in order to integrate colors that create the most impact. In order to create a warm look and feel for your kitchen you can add bold color style and techniques, which are normally used in open kitchen concept in country like New Mexico. This entry was posted in Home Improvement on January 19, 2012 by Mike.